This page describes the Neogene Period, including stratigraphy, paleogeography, and famous lagerstätten, followed by a sketched outline of some of the major evolutionary events. Hörnes 1853 proposed combining Lyell’s original (1833) Miocene and Pliocene epochs into a new unit, the Neogene, based on his interpretation of mollusc faunas (Steininger et al. 1997). In this original proposal, the Neogene did not include the Quaternary. Various proposals have been advanced at different times to include the Quaternary within the Neogene, and numerous articles can be found which assume just that. To be clear, the current position is that the Neogene does not include the Quaternary: the Cenozoic Era is formally divided into three periods – Paleogene, Neogene and Quaternary – and the Neogene comprises the Miocene and Pliocene epochs only (Cohen et al. 2015). The Neogene System does not have a type section, as such, because it was not originally conceived as a unit in its own right. Instead, it is an aggregate unit, comprising the Miocene and Pliocene series (epochs) which had been defined much earlier – at least as far back as the eleventh edition of Lyell’s Principles (Lyell 1872, table on p. 135) which in turn refers to an earlier source (Elements of Geology, 6th edition, p. 102). The Paleogene-Neogene boundary is coincident with the base of the Aquitanian Age which in turn defines the base of the Miocene Epoch. The Aquitanian GSSP is formally defined in the Lemme-Carrosio section in northern Italy, located at the 35 m level as measured downward from the top of the section. The horizon corresponds closely with the first appearance of the calcareous nannofossil Sphenolithus capricornutus and with the C6Cn.2n(o) reversal boundary (after Gradstein et al. 2012, p. 925-926). ‘In 1983, the base Pleistocene GSSP was ratified at Vrica, Italy, near the top of the Olduvai magnetic Subchron [2.58 Ma; Cohen et al. 2015], but the decision “was isolated from other more or less related problems, such as … status of the Quaternary.” The Gelasian Stage was later created (1996) to fill the “gap” between this GSSP and the “traditional” span of the Piacenzian Stage of the Pliocene Series’ (Ogg et al. 2008). Today, the International commission on Stratigraphy places the base of the Neogene at 23.03 Ma and the top at 2.58 Ma (Cohen et al. 2015). “Tectonic collision between South America and Panama began at 23–25 Ma. The collision is significant because it ultimately led to development of the Panamanian Isthmus, which in turn had wide-ranging oceanic, climatic, biologic, and tectonic implications” (Farris et al. 2011, p. 1007). “Between 25 and 23 Ma, the type of volcanic arc activity underwent a distinct change from hydrous mantle wedge–derived magmatism to localized extensional magmatism, indicating that the arc had impinged on South America … By 15 Ma, continued collision led to a transition from generally deepwater biogenic to siliciclastic sedimentation.... Between 9 and 6 Ma, rates of paleobathymetric change in sedimentary sequences reveal significant deepening across the Panama Arc.... Eustatic sea-level rise could in part be the cause of the deepening during the 9 to 8 Ma interval ..., but later deepening cannot be explained by sea-level change and must therefore have been due to subsidence. … At around 6 Ma, the Panama Arc began rising again … and has continued to do so until the present day. Arc uplift combined with sea-level falls driven by the expansion of the Greenland ice sheet around 3 Ma ... and the establishment of repeated Pleistocene glaciations beginning at 2.6 Ma ... resulted in the land bridge connecting North and South America” (O’Dea et al. 2016, p. 1-2; also see further discussion on the Quaternary page). “In the deep ocean, divergences in neodymium isotopes … and benthic foraminifera δ13C ... between Caribbean and Pacific sites, as well as an abrupt increase in the Pacific carbonate compensation depth, provide strong evidence that deepwater connection was shut off between 12 and 9.2 Ma. At this time, the deepest part of the sill of the Panama Arc must have shoaled to less than 1800 m and was perhaps as shallow as 1200 m … [W]estern Atlantic surface water salinity began to diverge from eastern Pacific values about 4.6 Ma and reached modern Caribbean values by about 4.2 Ma.... Deep Caribbean δ13C increased toward modern values at the same time, in response to flooding of the Caribbean by nutrient-poor North Atlantic Deep Water.... Finally, Caribbean carbonate preservation improved at 4.6 Ma, likely reflecting the replacement of corrosive Antarctic Intermediate Water by North Atlantic Deep Water as overturning increased in the northern North Atlantic.... The development of a large salinity contrast between the Caribbean and eastern Pacific ... is a particularly strong indication that the Panama Arc was mostly emergent by 4.2 Ma.... Nonetheless, vigorous exchange of near-surface waters between the oceans continued as demonstrated by similarities in the radiolarian..., foraminiferal..., and nannoplankton coccolithophore ... communities of the Caribbean and Tropical eastern Pacific…. 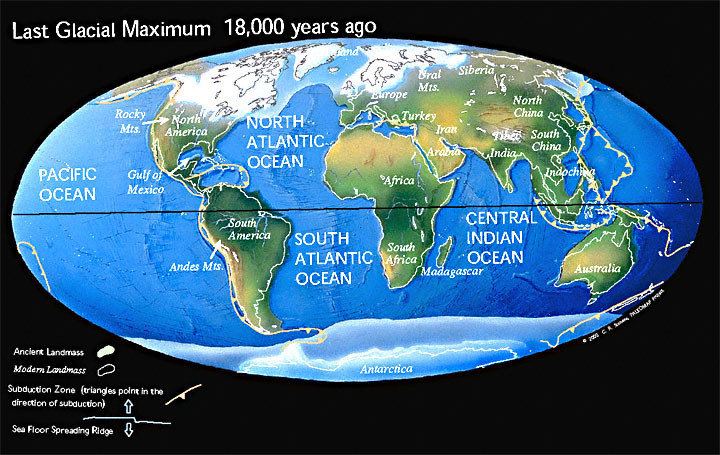 Our reviews and new analyses show that, before isthmus formation, the Panama Arc existed as a semi-emergent island chain through which abundant seawater flowed from the Pacific into the Caribbean since at least 30Ma. The arc collided, initially underwater, with South America around 24 Ma and has continued to do so to this day.... Meanwhile, the largest of the interoceanic straits were more than 1200 m deep, permitting massive interoceanic seawater exchange until these deepwater passages were extinguished by 9.2 Ma..., after more than 15 My of collision and uplift. Proximity of emergent land on the Panama Arc to South America increased the probability that terrestrial animals and plants could disperse between the continents across the seaways. Land mammal dispersals began ~20 Ma and trickled on for a further 17 My,most likely via rafting. Shallowseawater continued to be exchanged between the oceans until ~4 Ma whereupon the number of diverging marine species peaked..., and the Caribbean underwent a profound environmental, ecological, and evolutionary transformation ... resulting from significant constriction of the interoceanic seaways. Despite the near completion of a land bridge, ample interoceanic gene flow continued until at least ~3.2 Ma, suggesting that strong currents passed through the straits into the Caribbean, as suggested by models of the shoaling Panama Arc” (O’Dea et al. 2016, p. 3 & 6). Paleogeographic reconstruction for the Neogene from Christopher Scotese’s excellent ‘Paleomap Project’. “The Middle Miocene Climatic Optimum represents Earth’s most recent, natural, prolonged global warming event, and one that is thought to have caused major global ecological shifts (e.g., Flower & Kennett 1994; Böhme 2003; Mosbrugger et al. 2005; Maguire 2015). Oxygen isotopic profiles measured from deep-sea benthic foraminifera in sediment indicate that temperatures were significantly warmer in the deep ocean and at middle to high latitudes (Zachos et al. 2008; Shevenell et al. 2008). Other studies have shown that tropical sea surface temperatures were also higher than current values (You et al. 2009; LaRiviere et al. 2012). Paleobotanical records suggest a significant warming on land at middle to high latitudes, with temperature anomalies ranging from +10°C to +20°C in central and east Asia, a weak equator-to-pole latitudinal temperature gradient, and very humid conditions without significant seasonal patterns (Bruch et al. 2007, Bruch et al. 2011; Utescher et al. 2011). Despite considerable research, specific effects of the Middle Miocene Climatic Optimum on local paleo-communities remains uncertain” (Zheng et al. 2019, p. 87). In the late Neogene, the first of what would later, in the Quaternary, become a major migration of animals, began to leak across the narrow sea separating South and North America. “Around 9 to 8.5 Ma, the sloths Thinobadistes and Pliometanastes, derived from South American ancestors, appeared in North America.... Their success in the north, along with the arrival of the first South American edentate genera Glossotherium and Plaina in Mexico around 4.8 to 4.7 Ma..., is suggestive of their ecological, and therefore competitive, distinction from already established herbivorous mammals in North America.... The first record of North American immigrants in South America is the omnivorous endemic procyonid carnivore Cyonasua at ~7 Ma..., followed by the endemic sigmodontine rodent Auliscomys at ~5 Ma..., both of which are likely to represent much earlier migrations that have yet to be revealed in the fossil record. The South American flightless terror bird Titanis occurred in Texas between about 5.0 and 4.7 Ma.... A close relative of the capybara, Neochoerus, is first recorded present in Mexico around 3.8 Ma, and Glyptotherium is also recorded in Mexico around the same time...” (O’Dea et al. 2016, p. 5). Foulden Maar: Foulden Maar is an early Miocene volcanic crater lake deposit, and the first lagerstätte to be described from New Zealand. The fossils include leaves, flowers, fish and insects. The end of the Pliocene marked the beginning of a period of great climatic variability and sea-level oscillations. A study by Pimiento et al. 2017 estimated extinction rates among marine megafauna (mammals, seabirds, turtles and sharks) during this time to be three times higher than in the rest of the Cenozoic, with 36% of Pliocene genera failing to survive into the Pleistocene. Present day New Zealand is shaped by a tectonic regime comprising subduction to the north east (Hikurangi Trough), back arc extension through the Taupo Volcanic Zone, and crustal collision-driven mountain building in the southern axial range. Land area has generally increased over the past 5 million years, supplying “vast quantities of sediment to low-lying areas, the prograding inner continental shelf and offshore sedimentary basins” (Edbrooke 2017, p. 32). Böhme, M. 2003: The Miocene Climatic Optimum: evidence from ectothermic vertebrates of Central Europe. Palaeogeogr. Palaeoclimatol. Palaeoecol. 195: 389-401. Bruch, A.; Uhl, D.; Mosbrugger, V. 2007: Miocene climate in Europe - patterns and evolution: a first synthesis of NECLIME. Palaeogeogr. Palaeoclimatol. Palaeoecol. 253: 1-7. Bruch, A.; Utescher, V.; Mosbrugger, N. 2011: Precipitation patterns in the Miocene of Central Europe and the development of continentality. Palaeogeogr. Palaeoclimatol. Palaeoecol. 304: 202-211. Farris, D.W.; Jaramillo, C.; Bayona, G.; Restrepo-Moreno, S.A.; Montes, C.; Cardona, A.; Mora, A.; Speakman, R.J.; Glascock, M.D. ; Valencia, V. 2011: Fracturing of the Panamanian Isthmus during initial collision with South America. Geology 39 (11): 1007-1010. Flower, B.P. ; Kennett, J.P. 1994: The middle Miocene climatic transition-East Antarctic ice-sheet development, deep-ocean circulation and global carbon cycling. Palaeogeogr. Palaeoclimatol. Palaeoecol. 108: 537-555. Hörnes, M. 1853: Mitteilung an Prof. Bronn gerichtet: Wien, 3. Okt., 1853. Jahrbuch für Mineralogie, Geognosie, Geologie und Petrefakten-Kunde: 806-810. LaRiviere, J.; Ravelo, A.; Crimmins, A.; Dekens, P.; Ford, H.; Lyle, M.; Wara, M. 2012: Late Miocene decoupling of oceanic warmth and atmospheric carbon dioxide forcing. Nature 486: 97-100. Lyell, C. 1833: Principles of geology, vol. 3. John Murray, London: 1-109. — 1872: Principles of Geology (eleventh edition). John Murray, London (2 vols.). Maguire, K.C. 2015: Dietary niche stability of equids across the mid-Miocene Climatic Optimum in Oregon, USA. Palaeogeogr. Palaeoclimatol. Palaeoecol. 426: 297-307. Mosbrugger, V.; Utescher, T.; Dilcher, D.L. 2005: Cenozoic continental climatic evolutionof Central Europe. Proc. Natl. Acad. Sci. U.S.A. 102: 14964-14969. O’Dea, A.; Lessios, H.A. ; Coates, A.G.; Eytan, R.I.; Restrepo-Moreno, S.A.; Cione, A.L. ; Collins, L.S. ; de Queiroz, A.; Farris, D.W.; Norris, R.D. ; Stallard, R.F. ; Woodburne, M.O. ; Aguilera, O.; Aubry, M.-P.; Berggren, W.A. ; Budd, A.F. ; Cozzuol, M.A 2016: Formation of the Isthmus of Panama. Science Advances 2 (8): 1-11. Pimiento, C.; Griffin, J.N. ; Clements, C.F. ; Silvestro, D.; Varela, S.; Uhen, M.D. ; Jaramillo, C. 2017: The Pliocene marine megafauna extinction and its impact on functional diversity. Nature Ecology & Evolution 1: 1100-1106. Shevenell, A.; Kennett, J.; Lea, D. 2008: Middle Miocene ice sheet dynamics, deep-sea temperatures and carbon cycling: a Southern Ocean perspective. Geochem. Geophys. Geosyst. 9: Q02006. Steininger, F.F. ; Aubry, M.P. ; Biolzi, M.; Borsetti, A.M.; Cati, F.; Corfield, R.; Gelati, R.; Iaccarino, S.; Napoleone, C.; Rögl, F.; Rötzel, R.; Spezzaferri, S.; Tateo, F.; Villa, G.; Zevenboom, D. 1997: Proposal for the global stratotype section and point (GSSP) for the base of the Neogene (the Palaeogene/Neogene boundary). In Montanari, A.; Odin, G.S. ; Coccioni, R. (ed.) 1997: Miocene stratigraphy - an integrated approach. Developments in Paleontology and Stratigraphy 15: 125-147. Utescher, T.; Bruch, A.; Micheels, A.; Mosbrugger, V.; Popova, S. 2011: Cenozoic climate gradients in Eurasia? A palaeo-perspective on future climate change?. Palaeogeogr. Palaeoclimatol. Palaeoecol. 304: 351-358. You, Y.; Huber, M.; Müller, R.D. ; Poulsen, C.J. ; Ribbe, B. 2009: Simulation of the Middle Miocene climate Optimum. Geophys. Res. Lett. 36: L04702. Zachos, J.; Dickens, G.; Zeebe, R. 2008: An early Cenozoic perspective on greenhouse warming and carbon-cycle dynamics. Nature 451: 279-283. Zheng, D.; Shi, G.; Hemming, S.R. ; Zhang, H.; Wang, W.; Wang, B.; Chang, S. 2019: Age constraints on a Neogene tropical rainforest in China and its relation to the Middle Miocene Climatic Optimum. Palaeogeography, Palaeoclimatology, Palaeoecology 518: 82-88.